Welcome to southern Italy, famous for its dramatic landscape and vibrant seaside atmosphere. 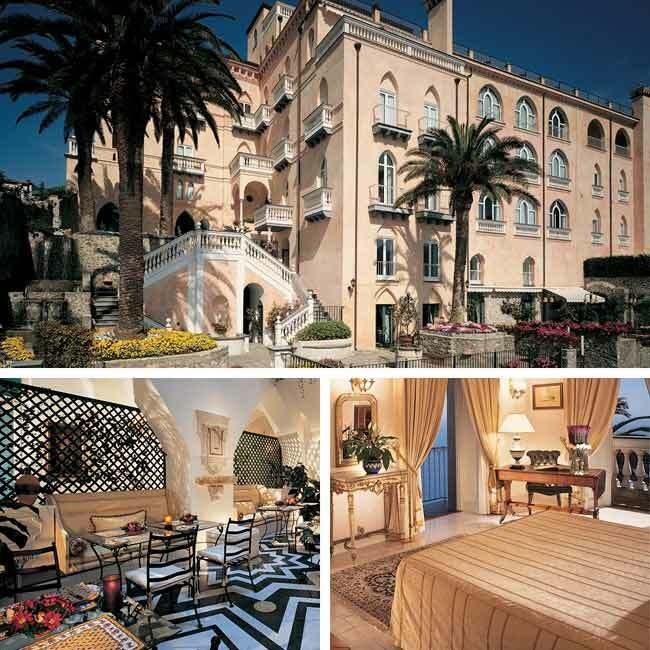 Your private driver will pick you up from Naples International Airport and take you to your luxury hotel in Sorrento. Enjoy the remainder of your day discovering the city's vibrant ambience. Ask your Leisure Travel Consultant for their favorite restaurants, cafes and entertainment. Explore Sorrento on your own or sign up for an optional cooking class where you will learn to create delicious Italian dishes. Ask your leisure travel consultant for recommendations of their favorite activities and sites in Sorrento. Set out on your private tour to the ancient city of Pompeii, which was buried following the eruption of Mount Vesuvius, in 79AD, and miraculously preserved by volcanic ash. 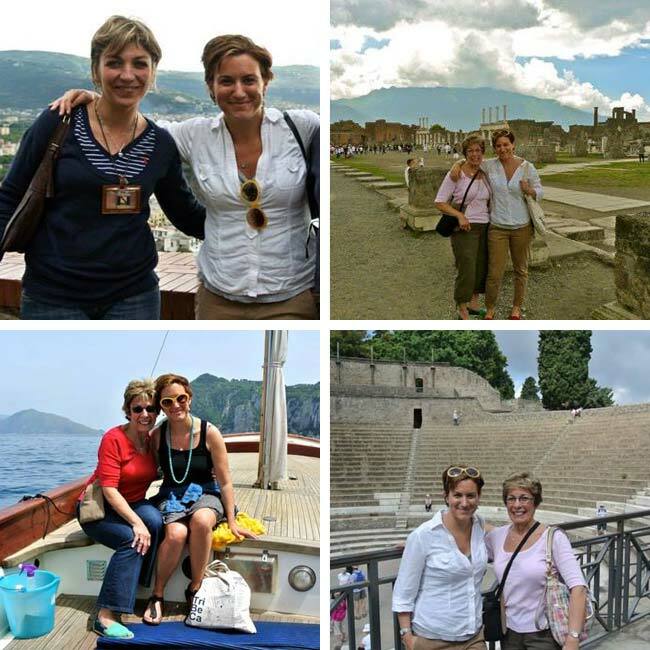 See the excavated remains of the Forum, the Thermal Baths, the Lupanare, and Vetti's House featuring beautiful frescos. Continue to Mt. Vesuvius, the only active volcano in continental Europe, also responsible for the destruction of Pompeii. You will have the opportunity to climb the mountain for approximately 45 minutes, accompanied by your guide. Walk around the crater, at 3,900 feet, and take in the breathless panoramic views of the Bay of Naples, from east to west. You may even get to witness in the depths of the crater, plumes of steam dispensing from the sleeping, but still active, volcano. After breakfast, board a ferry for the jet set island of Capri, where you will be picked up and taken to your luxury hotel. Enjoy a day of relaxation at one of the island's beautiful beaches or explore the islands remarkable sites, such as the Blue Grotto and Villa San Michele. Ask your leisure travel consultant for their recommendations of favorite things to do and see. After breakfast, you can either board a ferry for the Amalfi Town or Positano. Upon arrival, you will be transferred to your luxury hotel. Take advantage of your free time by soaking up the local culture, visiting the surrounding villages or relaxing at your luxury hotel. Ask your travel consultant for their personal tips of favorite activities and excursions while visiting the Amalfi Coast. After breakfast, you will be transferred to the Naples Airport, to catch your departure flight. 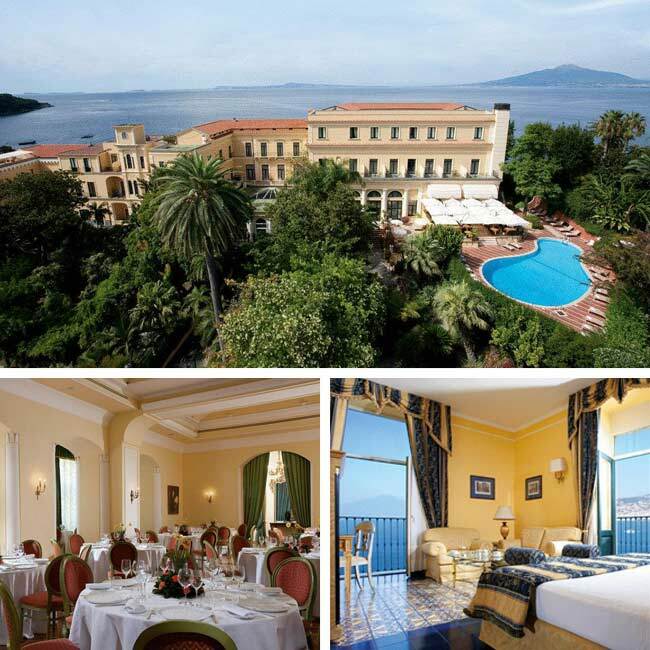 Owned by the Fiorentino family since 1834, the Grand Hotel Excelsior Vittoria is a luxury hotel off the Amalfi Coast, with ancient ruins of the Roman Emperor Augustus lying beneath the property. The hotel is perched above the cliffs, with spectacular views of the Bay of Naples and Mount Vesuvius. A beautiful lush private garden and a five-acre orange grove surround the hotel providing a peaceful and natural environment exclusive to guests. Overlooking the Marina Grande and opposite the Gulf of Naples is the Maison La Minervetta, a hotel sitting in a unique position off the cliff of the Amalfi Coast, just minutes away from the center of Sorrento. Appreciate the breathtaking views in one of the 12 Mediterranean style rooms, with floor to ceiling windows, offering exclusive comforts in their fashionable modern interior design, with personalized character and amazing artwork. The Grand Hotel La Favorita, a charming retreat with endless views of the Gulf of Naples and Mount Vesuvius, is a luxury hotel off the Amalfi Coast, which rests in an oasis of traditional orange and lemon gardens. 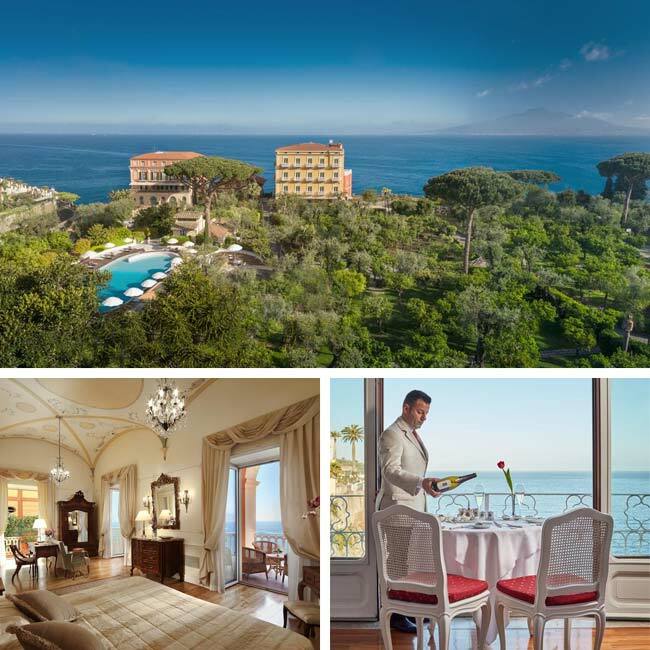 Having a perfect location, in the heart of Sorrento, this extravagant hotel offers spacious and elegant accommodations, decorated in true Mediterranean style with hand painted tiles, frescoes and cascading chandeliers. 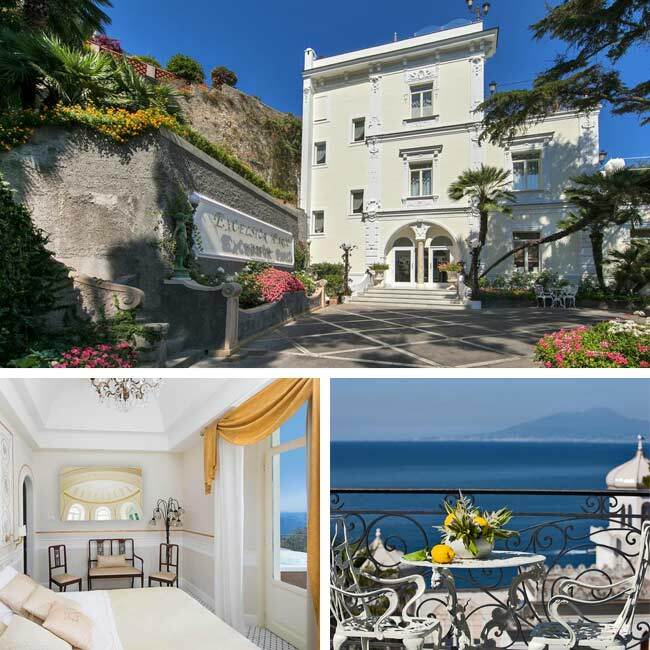 The Imperial Hotel Tramontano is located off the Amalfi Coast, in the heart of Sorrento, a one-minute walk from the beach, overlooking the Gulf of Naples. The beautiful garden was designed in 1888 with centuries-old Mediterranean and sub-tropical plants. Dating back to the 16th century, the hotel features classic and refined elegant styles throughout. Guests love the delicious breakfast, spacious rooms, welcoming staff and the fabulous location with easy walkable access everywhere. 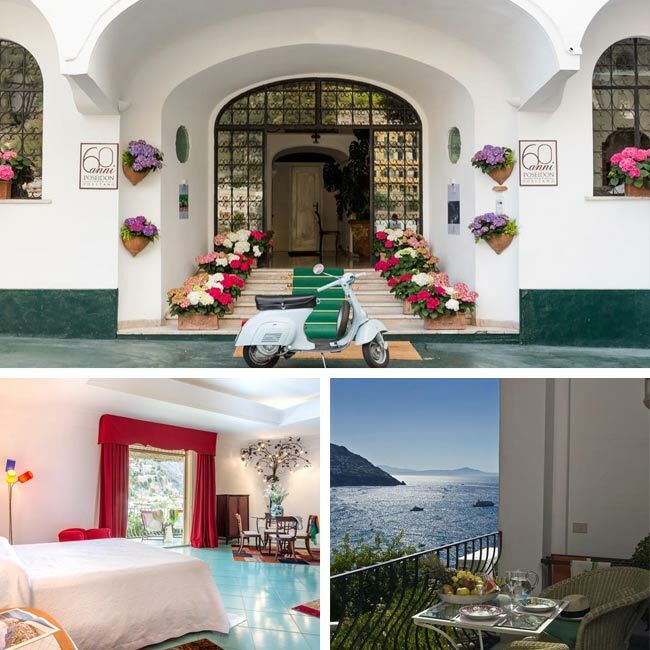 Hotel Covo dei Saraceni is a fabulous coastal hotel overlooking one of Italy’s most beautiful stretches off the Amalfi Coast, in the town of Positano, which still retains its age-old folklore and fishing traditions. Its prime beachfront location, amazing pool, and great views help guests take full advantage of their relaxing vacation. Make sure to try the delicious delicacies of the Mediterranean at one of the three restaurants on site. 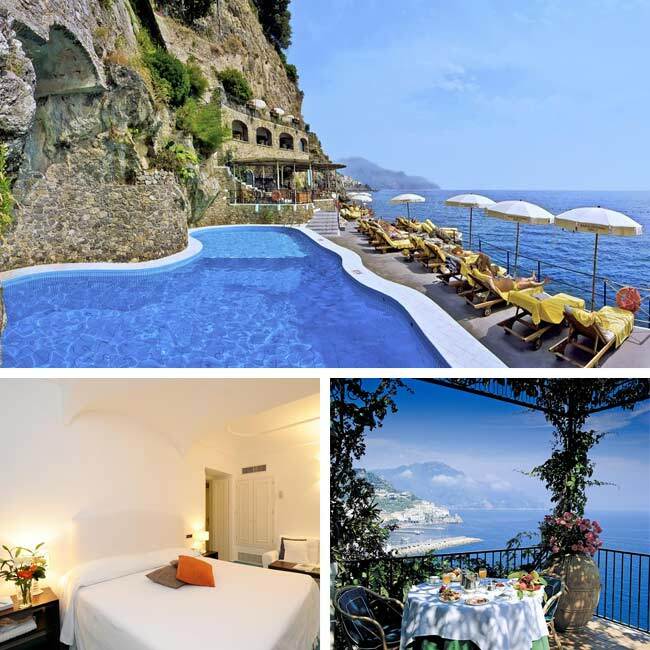 Hotel Le Agavi occupies a dream location on the Amalfi Coast; a stunning property overlooking the bay of Positano. Enjoy the spectacular views from the hotel’s swimming pool and seaside bar or in your private suite, all elegantly furnished and equipped with every modern comfort, opening out on to a private balcony or terrace. Soak up the sun at the beach club with white pebbles and turquoise clear water, an ideal corner of paradise. 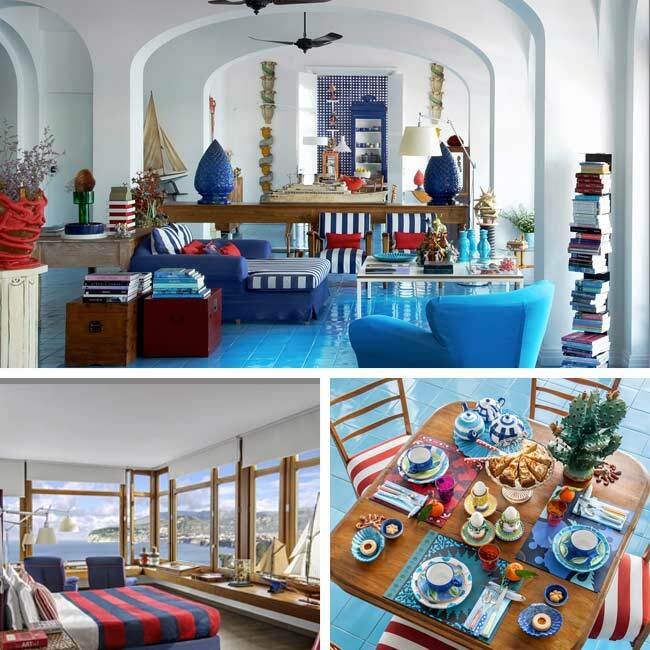 The Hotel Poseidon, once a beautiful Mediterranean villa in the heart of Positano, has been renovated into a luxury hotel off the Amalfi coast, one of the most beautiful and picturesque places of the world. For the past 50 years, Poseidon has offered discreet and elegant hospitality in harmony with Positano’s image and tradition. The staff’s warm welcome helps add to the cozy atmosphere, allowing guest to feel at home. Discover the Amalfi Coast’s quaint villages, secluded beaches, vineyard, citrus and olive groves, all whilst staying at the Grand Hotel Convento di Amalfi. This 5-star hotel, originally a monastery, was built in the 12th century overlooking the Bay of Amalfi. Today, it is a modern hotel, part of the LVX brand by Preferred Hotel Group, featuring a characteristic pergola and enchanting Arab-Norman cloisters, all reflecting the architectural traditions of the region. A late 19th century liberty style villa immersed in the beautiful scenery of the Amalfi Coast, an elegant seaside residence surrounded by the perennial blue of the Mediterranean Sea and sky, by fondly cultivated olive groves and fruit orchards. 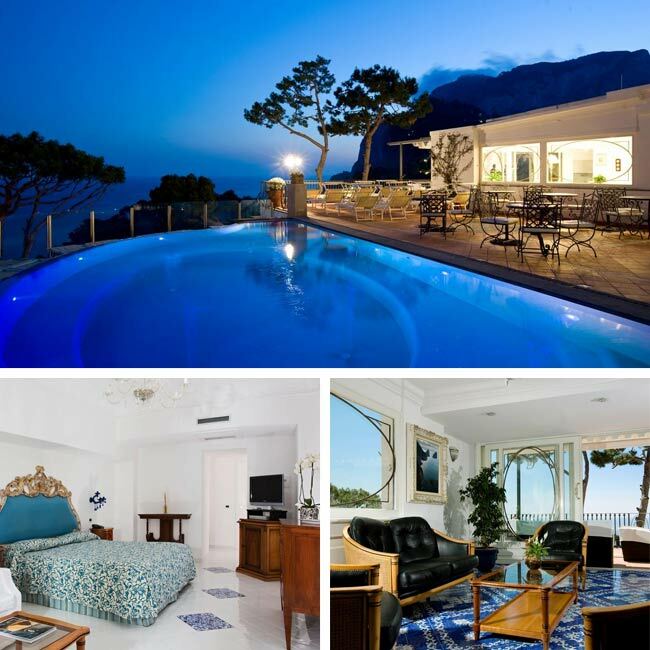 Hotel Santa Caterina of Amalfi, is a luxury hotel, a special place to experience the finest of Italian hospitality and lasting sensations of wellbeing, whilst enjoying the sweeping views of the Bay of Salerno. 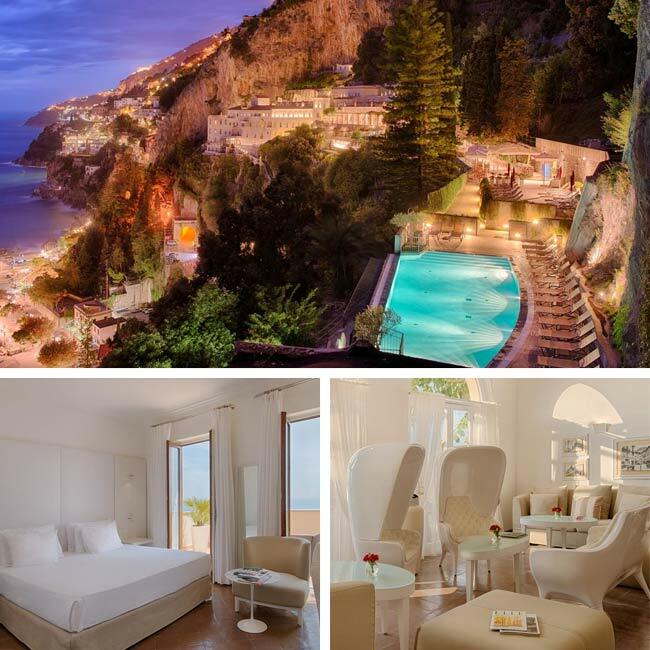 Palazzo Avino is a stunning five-star deluxe hotel on Italy's famed Amalfi coast. Built in what was once a 12th century private villa for an Italian noble family and opened as a hotel in 1997, Palazzo Avino has been rated as one of the world's finest hotels and boasts one-star Michelin dining. All rooms are decorated with Vietri tiles, antique furnishings, brass accessories and appliances, and modern high-tech amenities. Casa Morgano is a luxury boutique hotel perched on the Amalfi Coast and walking distance to town, created by hoteliers for generations. Casa Morgano has all the characteristics of the island's most sumptuous private villas including floors tiled in precious hand-painted majolica, antique furniture, massive floor-to-ceiling windows, and spectacular sea view terraces. Relax on your sea view terrace, savor the island's delicious cuisine served by the pool, or soak up the sunshine in the fragrant Mediterranean garden. Hotel Excelsior Parco is a captivating Art Nouveau villa with a view over Capri, off the Amalfi Coast. Their moto, "Our guests deserve the best Capri has to offer", guarantees to offer not only gorgeous rooms, impeccable service, and luxury amenities, but also personalized attention to ensure that each of their clients has an unforgettable stay. Start your day off with breakfast serving local specialties and other organic options and a morning stroll into town. We are now back home and would like to give you feedback from our trip. First of all thank you, we had a fantastic time! Your organisation and planning was perfect. All the drivers were professional, courteous and punctual. Nothing was a problem. The guides were professional, well informed and accommodating to our requests. The hotels were excellent for 4-star in Italy. The positions were all very central. The only one we were not keen on was the one in Naples but in saying that we could not have had a better position and the staff was excellent. Also there was a festival on so Naples was very busy. Thank you for the complimentary dinner in Reggio Calabria we had a great night, the restaurant had a lovely view. One of the highlights for us was our lunch at the winery Casa Emma. We would certainly recommend it. 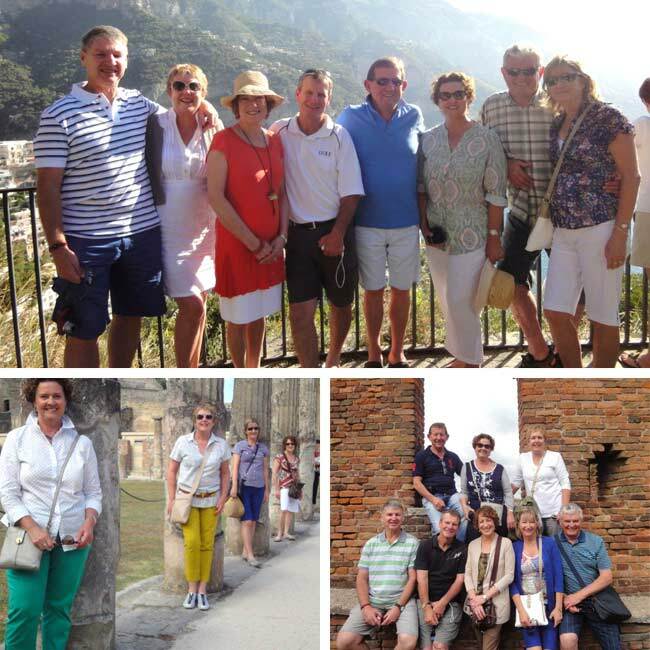 Once again thank you, our entire group had an amazing time and we would have no hesitation in recommending you. Please feel free to use us as a reference. On another matter, our daughter and son-in-law are planning a trip next September to Europe. They are keen to do a cruise round the Greek Isles. As they are in their mid 20s I was wondering if you could recommend a cruise which caters more for young people. Thank you again we look forward to hearing from you. Also - our tour guide (Luisanna Palumbo) and our driver (Nello Aversa) for our adventure to Pompeii and Vesuvius were the best people, knowledgeable, sweet and thoughtful.They suggested a great vineyard for lunch, Cantina del Vesuvio. We had an incredible experience. In fact all of the drivers who collected us and guided us to the next stop were prompt and very nice. Alviani Viaggi did a wonderful job. Both Tara and I will highly recommend you and your travel agency to all of our friends and family - you planned an outstanding trip. 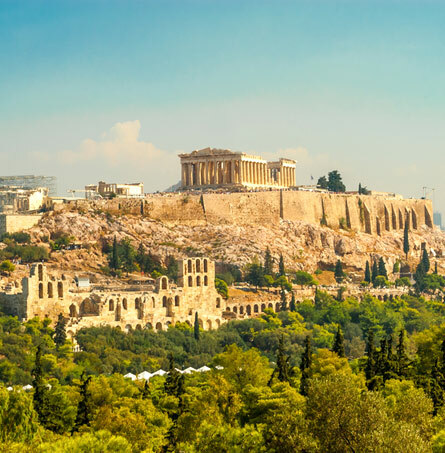 One of these days we'd like to take a trip to Greece - and you can be sure we will call on you.